I’ve selected autumnal and cosy items for you this month. First up, we have a delightful little embroidery hoop from Meliferra. ‘Coffee’. Simple, cute and oh so necessary for those dark mornings. 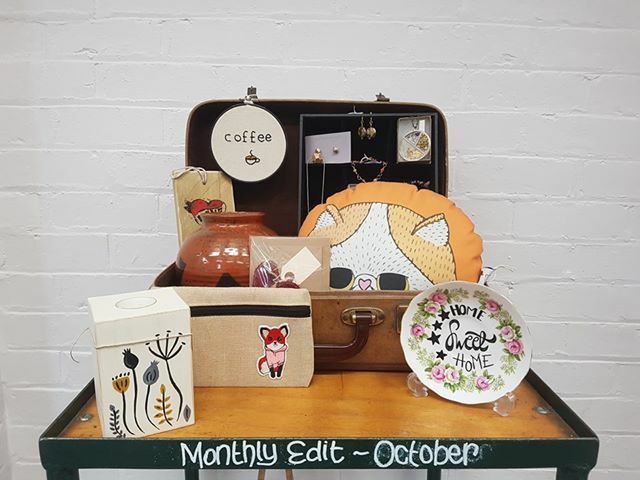 Just under the ‘Coffee’ hoop is a wooden block hanger by Sombrero Print Making. Hang them together and declare your love for the caffiene! Also, just peeping out at the bottom of the image is a beautiful, robust vase by tenant ceramicist, Peter Swailes. Peter’s work is strong and very present. The glaze work plays on the natural form of the piece giving them all a unique character. Wonderful colours. This block candle holder houses a little tealight to light up your evenings. The hand painted design, in mustards and greys, depicts stylised flora. We also have a matching one so you could potentially have a pair. The little fox in the background is on one of the little pencil cases made by Jo’s Crafts & Bags. We have a wide selection in our Gallery Shop for you to choose from. Coming across to the left, we have Pixie Drew’s upcycled ‘Home Sweet Home’ plate, which, let’s face it, is where we are all going to be spending the majority of our time now the nights are drawing in! All Pixie Drew’s plates are hand lettered with lovely (and sometimes cheeky!) phrases. GRUMPY CAT! Oh, Grumpy Cat. All the Autumnal Feels from this feline whinge-bag! This Duck and Peach squishy cushion will cheer anyone, up. Next to it is a fabric heart hanger by Designate. Filled with lavender, it is a sweet little gift to give along with the greetings card inside. So there we have it. A Monthly Edit for the start of autumn. As always, if you see anything that you would like to buy, please drop us a line on hello@weststudios.co.uk or call (01246)500799. We’d love to see you. Older PostDo You Want To Learn Something New?